In English law, feoffment was a transfer of land or property that gave the new holder the right to sell it as well as the right to pass it on to his heirs as an inheritance. It was total relinquishment and transfer of all rights of ownership of an estate in land from one individual to another. In feudal England a feoffment could only be made of a fee (or "fief"), which is an estate in land, that is to say an ownership of rights over land, rather than ownership of the land itself, the only true owner of which was the monarch under his allodial title. Enfeoffment could be made of fees of various feudal tenures, such as fee-tail or fee-simple. The conveyance or delivery of possession, known as livery of seisin was effected generally on the site of the land in a symbolic ceremony of transfer from the feoffor to the feoffee in the presence of witnesses. Written conveyances were customary and mandatory after 1677. The feoffee was thenceforward said to hold his property "of" or "from" the feoffor, in return for a specified service depending on the exact form of feudal land tenure involved in the feoffment. Thus for every holding of land during the feudal era there existed an historical unbroken chain of feoffees, in the form of overlords, ultimately springing from feoffments made by William the Conqueror himself in 1066 as the highest overlord of all. 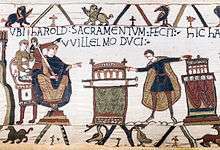 This pattern of land-holding was the natural product of William the Conqueror claiming an allodial title to all the land of England following the Norman Conquest of 1066 and parcelling it out as large fees in the form of feudal baronies to his followers, who then in turn subinfeudated the lands comprising their baronies into manors to be held from them by their own followers and knights. When the new feoffee sub-enfeoffed another person from his holding, for example where he created a new manor, he would become overlord to the person so enfeoffed, and a mesne lord within the longer historical chain of title. In modern English land law the theory of such long historical chain of title still exists for every holding in fee simple, although for practical purposes it is not necessary at the time of conveyance to recite the descent of the fee from its creation. The establishment of a national Land Registry has obviated the need for recitals of descent. In China and some other South East Asian countries, from the time of the Zhou Dynasty (1046–256 BCE) relatives and descendants of the ruling family were granted enfeoffments in return for pledging to protect the King or Emperor in times of war. ↑ "The Zhou Dynasty". China Civilisation Centre, City University of Hong Kong. Retrieved November 11, 2010. Look up feoffment or enfeoffment in Wiktionary, the free dictionary. Chisholm, Hugh, ed. (1911). "Feoffment". Encyclopædia Britannica (11th ed.). Cambridge University Press.